Every summer we’ve become accustom to seeing the beautiful orange and black wings of the monarch butterfly in our yards and gardens. So when we think of wild animals losing their habitats, we don’t usually envision butterflies. Instead we might think of elephants, rhinos, and tigers in faraway places. But monarch butterflies are losing their homes right here in the US. Migrating monarch butterfly populations are continuing to decline. In Mexican forests, monarchs inhabited only 6.12 acres in December 2017, a 15% decline over the last year and an 86% drop since 1996. Many factors have contributed to the decline in monarchs, including climate change, the deforestation of habitat in Mexico, and the loss of native plants in the US that monarchs rely on to feed and reproduce. 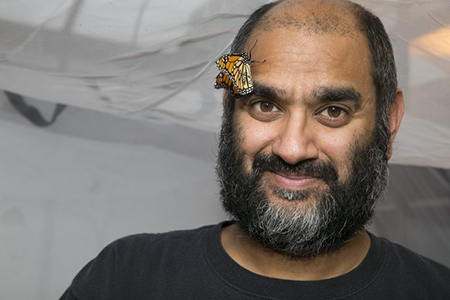 One man who has made real strides in the research of monarch butterflies and their habitat is Anurag Agrawal. In 2017 he wrote the book Monarchs and Milkweed - A Migrating Butterfly, a Poisonous Plant, and Their Remarkable Story of Coevolution. 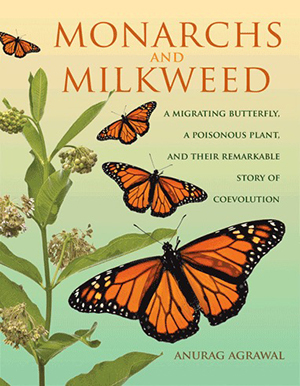 In his book, Agrawal dives into major scientific discoveries, including his own original research, and traces how plant poisons have not only shaped monarch-milkweed interactions but have also been culturally important for centuries. Extreme migration is right! The monarch spends its winter months in Mexico and will travel about 3000 miles to get there. This great migration usually starts in October of each year, but can start earlier if the weather turns cold sooner than that. Agrawal agrees that this migration is not only fragile, buts it’s declining. Some research suggests that the lack of milkweed, monach butterflies main source of food, is to blame. Agrawal advocates that the focus on milkweed in monarch butterfly restoration might be misplaced. He believes solutions that address habitat fragmentation and increasing the availability of late season nectar plants should receive more consideration. So what’s the answer to restoring monarch butterflies and their habitats? There may not be just one easy solution. More attention is being brought to the decline of monarch butterflies thanks to people like Agrawal. In the United States, there is a massive effort to provide habitats for monarch butterflies, imperiled bumble bees and other pollinators. But there is no one group or agency that is currently dedicated to supporting monarch conservation, so it needs to be a group effort. All organizations, agencies and individuals must work together to improve, restore and create grassland habitats to save monarchs. As individuals, we can help monarch butterflies by reducing the use of pesticides, and leaving a few weeds in the garden. Having weeds around actually allows for biodiversity, which is likely to protect the animals that visit those plants.